Like most Muscadet, Noëlle looks pale lemon with a slight fizz. Young, powered aromas include pear, yeast, and mineral. Dry, crunchy acidity makes for a featherweight body, that is clean and not fruity. Flavors of wax, salt, lime juice, and coastal air fill our palates for a pleasant, medium length. Noëlle’s Côteaux is good (3 of 5), simple, fresh, and unassuming. The price is perfect at €4.50. Again, a lithesome lemon color. Average intensity aromas turn more to ripe golden delicious apple, vanilla, and slight nutmeg. Gone are the mineral and pear of above. Acids still reigns supreme, but a fuller, medium body is doubled by a creamier texture. Mind you, this Grandlieu still feels zippy; this is France’s coldest and wettest climate after all. Flavors again are average intensity and similar to CdL, with grapefruit, and fresh lemon juice, but notably more salt and mineral. The length is longer too. Herbauges’ Grandlieu is good (3 of 5) and certainly fuller yet saltier (€6.20). 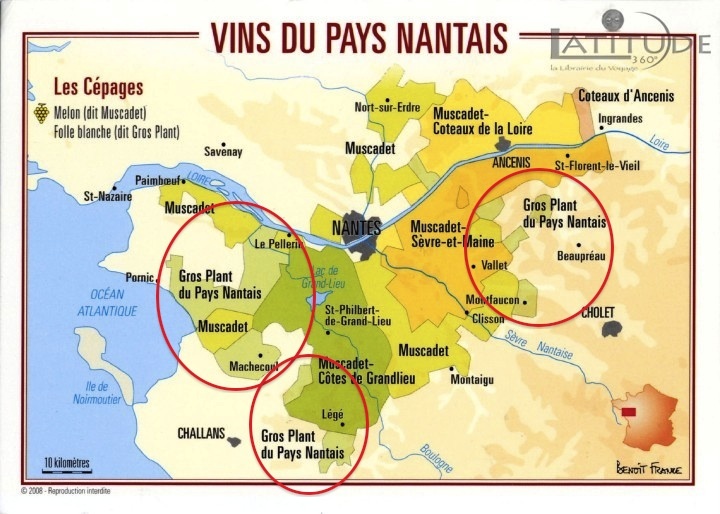 Muscadet’s fringes are too coastal or hilly (E) to grow quality Muscadet. Instead Folle Blanche, aka Gros Plant, aka that bland base for Cognac and Armagnac, has infamy for France’s leanest, most acidic wine. A dutch need for liquor spread it all over Western France. Today, vineyards dwindle for this cooking wine. This Folle Blanche looks water-clear with barely a tint of green. However, the nose is markedly loaded, with melon, citrus, and bubblegum aromas. Dryness, no body, and high acids lead to limp flavors of citrus, grass, and salt. The length is short. The wine is acceptable (2 of 5) for drinking, but probably better in a sauce (€4.15). Fiefs Vendéens grows Pinot, Cab, and Negrette. It is a small, marginally Loire Valley wine region. Today’s white consists of 80% Chenin Blanc, and 20% Chardonnay. The color looks pale and lemon. Delicate aromas of ripe white melon, nut, and light butter woo us. The palate feels dry, only moderately acidic, with flecks of woody tannin (from local oak), some alcohol, some body, and a lovely creamy texture. Flavors of ripe white pear and melon fight, creating a dual personality of on-and-off cream -vs- wild tropical fruit. The length is medium. Coirier’s white is pretty good (3 of 5). (€11.80). So, from the Loire’s Western fringes, an array of interesting, variant, and decent whites can be bought for under $15. Worry not, next Monday we’ll up our game (and EU Austerity price point). 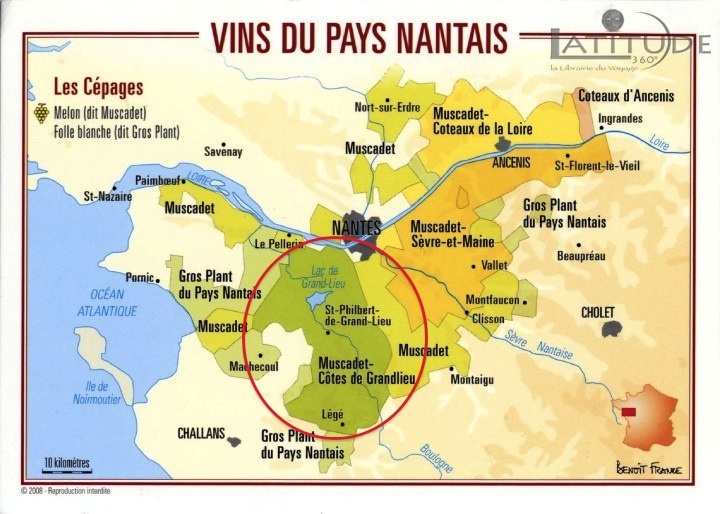 This entry was posted in Muscadet, White, WINERIES WANDERED and tagged Armagnac, chenin blanc, Cognac, Coteaux de la Loire, European Union, Fiefs Vendéens, Folle Blanche, France, Grand-Lieu, GrandLieu, Landelle, Les Vignerons de la Noëlle, Loire, Muscadet, Noëlle, Savenniéres. Bookmark the permalink. Wonderful maps help to realize how extensive and varied this grop of grapes is. Goes to show how complex even stereotyped white wine regions can be. Never a dull moment!